SPARKS is a construction competition made up of many separate teams competing under various topics. Each team works through and presents on real world problems that are judged by various sponsoring companies. This provides invaluable experience, not to mention that it is an extracurricular activity that recruiters take very seriously. Over 50 construction companies recruit at the career fair which means finding an internship or full time job after the competition is a very real possibility. 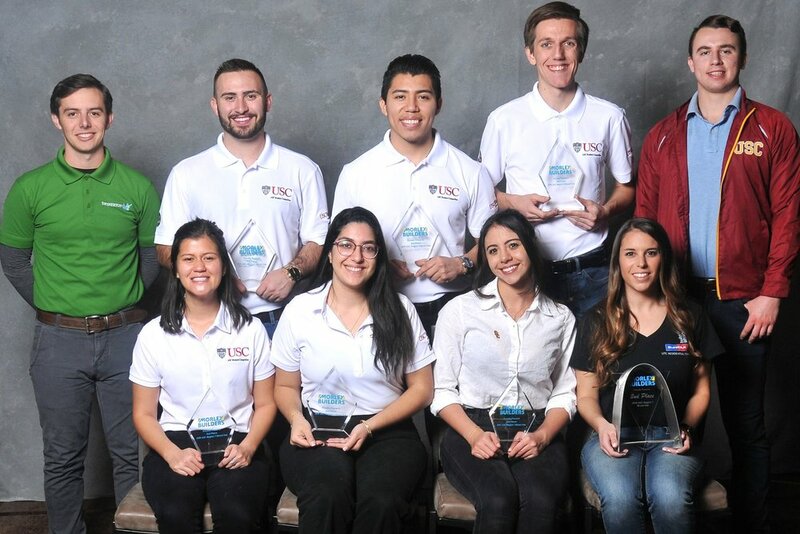 To compete in the Associated Schools of Construction (Region 6 & 7) Student Competition, USC CMAA sends seven teams comprised of six students and two alternates to the annual student construction case competition. 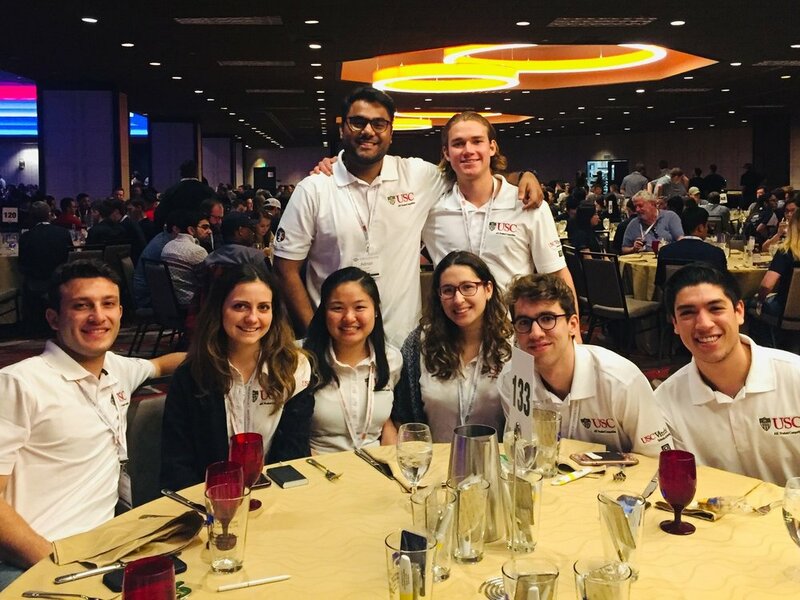 With the support of a dedicated cadre of USC Alumni, USC CMAA begins preparing students in September by scheduling individual team meetings and hosting “Dinner and Learns”, alumni-taught information sessions that benefit all teams. The Heavy Civil Competition, sponsored by Granite Construction, focuses on the construction of large-scale infrastructure projects, be it airports, highways, bridges, etc. Students will learn different the production rates and abilities of types of heavy construction equipment as well as major infrastructure operations such as paving, earthwork, and concrete pouring. The competition focuses on the ability to read and understand plans and specifications, perform quantity takeoffs, and understand the challenges associated with the construction of the given project. The Pre-Construction Competition, sponsored by PCL, focuses on the phase of construction that occurs before any physical building begins. Since pre-construction is common to all areas of construction there is no specific focus of the projects which can range from various types of resident buildings to commercial buildings. The competition focuses on the ability to plan and manage the construction process starting from the invitation to bid and receiving the plans and involves estimating, scheduling, site planning, as well as some basic BIM coordination. The deliverables for the competition begin before the day of, with a bid qualification proposal due upon arrival in Reno on top of the day of competition deliverables. Overall the Pre-Construction Competition relies on an understanding of all the area's of the construction industry and forces the team to synthesize them to successfully plan for a smooth project delivery. The Commercial Competition, sponsored by Hensel Phelps Construction, focuses on construction in the categories of: commercial/office, education, healthcare, government, and aviation. Students will learn about the staffing, estimating, scheduling, safety regulations, and other common issues that arise every day in the construction industry. In the Mixed Use competition, sponsored by Morley Construction, students encounter large multi-story projects that are residential in nature yet have a mixed-use component. Students live a day in the life of a Project Engineer and complete tasks that would be encountered by a Project Engineer on a daily basis. Participants will learn skills such as scheduling, estimating, plan reading, bid analysis, site logistics and quantity take-offs. Formerly known as the BIM problem (Building Information Modeling), the VDC competition sponsored by WEBCOR Builders, focuses on the transferable usage of 3-D modeling into the cost estimation and activity scheduling steps; integrating all three elements simultaneously in the preconstruction phase of a project. Students will demonstrate the ability to interpret contractual documents into the latest modeling software and utilize a model of their own design, as accurate as possible, to extrapolate necessary quantities and visual data to best present a project to a client. The Design Build competition, sponsored by Swinerton Builders, allows students to showcase their creativity in shaping the logistics, schedule, and cost to meet the quality goals of a combined contract for design and construction services. A well-executed Design-Build contract can lower unit costs, and construction and delivery speeds while minimizing cost and schedule growth. This type of contract is increasingly being utilized by general contractors and desired by owners. The Integrated Project competition, which has traditionally been the graduate competition, incorporates elements of several of the competitions above to challenge students in conceptual and practical knowledge. This problem statement, sponsored by Clark Construction, will allow for mixed teams of undergraduate and graduate students.